The Russian Revolution, which is now commemorating its 100th anniversary, had several effects and repercussions on various scientific fields, from physics to psychology. However the revolution may have had the most serious impact on biology-medicine. This was the field that saw the greatest “intervention” in science in general by Russian leaders: the famous case of Lysenko, who caused so much pain and numerous deaths . One of the most extreme goals of Soviet biology was the attempt to obtain hybrids of humans and chimpanzees, a research project headed by one of the leading Russian scientists, Ilya Ivanov. After previously obtaining some interesting animal hybrids, this foremost expert in the field of artificial insemination in animals set out to do the same with humans and chimpanzees. In fact he made experiments –or tried to do so– in both directions, although without success. In this case the apparent aim was to obtain hardy “workers” for arduous tasks or extreme experiments, and there was talk of their usefulness for space missions. Subsequently, when these hybrids failed to materialize, monkeys, dogs, mice, cats and others were sent into space, while the backbreaking work was done by the inmates of gulags and work camps in places like Siberia, where thousands of people died. These experiments also sought to reassert the “animal” nature of man, something that at this time was under discussion as a result of Darwin’s new Theory of Evolution. All that remains of these experiments and ideas –sometimes captured in works of literature or films– are the legends of strange animals roaming around Russian research centers at that time. Under the direction of the Soviet Union, a rocket manned by a turtle took off on September 14, 1968. The Horsfield’s tortoise made a trip around the moon accompanied by fruit flies, mealworms and other live specimens in the Zond 5 craft. 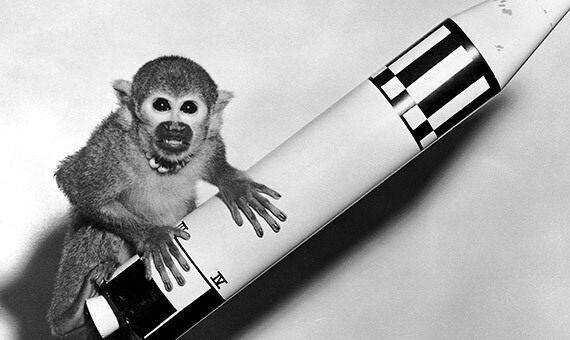 These were the first animals to go into deep space. Another somewhat unorthodox piece of biological research done in Russia after the revolution was to use blood from dead bodies for transfusions. It should first be noted that Russia in the 1920s was at the forefront of research on human blood transfusions, and the first blood banks in the world were set up at that time in Moscow and Leningrad. Specifically, one scientist, Alexander Bogdanov, had the idea of using blood transfusions in the fight against aging. And who better to use as a guinea pig than himself? The first eleven transfusions appear to have been successful (his friends found him rejuvenated), but he finally died after giving himself a transfusion with blood from a student suffering from tuberculosis, among other diseases. Some say this was not the failure of a “mad” scientist, but that he took his own life due to problems with the Soviets. 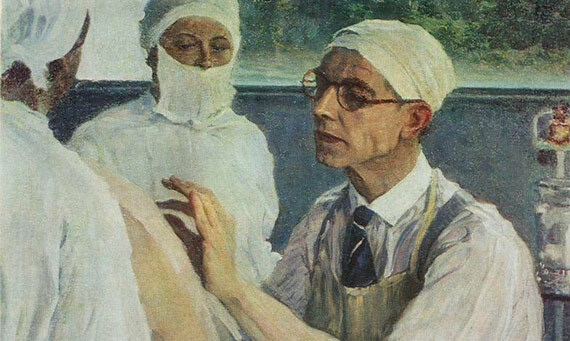 In the 1930s another scientist, Serguei Yudin, devised a series of methods to conserve and store the blood of dead people and use it for transfusions into living people. Like many other scientists, Yudin had problems with the Revolution, and was stripped of his responsibilities and sent to the concentration camps; he was finally rehabilitated after the death of Stalin, although he died very soon after. Some documents by the Nobel prizewinner Hermann J. Muller that mention his attempts to use the blood of corpses for transfusions have recently been unearthed in the University of Indiana. After attending several US universities, this American geneticist and activist emigrated to Germany, but left for Russia after the rise of the Nazis. Once there, he became part of the anti-Lysenko movement, and seeing himself in danger, fled to the Spanish Civil War where he joined the International Brigades, this time as a medical-biological adviser on blood transfusions . Soviet Russia was also a “force” in research into the origins of life. In any discussion of this field of research, one of the first names to be mentioned is the Russian researcher Aleksandr Oparin, who in the 1920s claimed that life originated in a “primaeval soup” of chemical elements. But there was little evidence of this hypothesis. However, after the Russian Revolution some scientists apparently succeeded in proving it experimentally, and foremost among them was the researcher Olga Lepeshinskaya. She believed that if nucleic acid was mixed with carbonated molecules and the mixture was irradiated with ultraviolet light, what would appear would be no less than living cells. She also claimed that living cells –and even dead ones– produce a type of vesicle that give rises to new cells, as these cells contain a vital substance. This theory contradicted the underlying scientific premise of biology that states that all living cells come from another living cell. Her research earned her the support of Lenin, Stalin, Lysenko and even of Oparin himself, who awarded her the Stalin medal for science. However, she was discredited when it emerged that her supposed experiments had been totally falsified. Since then, much work has been done to attempt to investigate the abiotic origin of life, but there is still no clear demonstration. Although there are a multitude of experiments and hypotheses, none of them has proved definitive. Parrington, J. 2017. Science, socialism and the Russian Revolution. International Socialism-isj.org.uk-Issue 155, 29th June. Anonymous. 2017, New Scientist, Oct.18th. 5 “mad scientists” of post-Revolution. Russia. Domínguez, N. 2012. Las transfusiones con sangre de cadáver pudieron prolongarse de forma “clandestina”. Materia. El País. 14/09/2012.